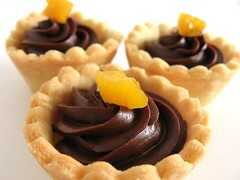 Passionately Chocolate Tartlets - Do You Know The Muffin Man? Notes: I had trouble rolling the sweet tart dough as it cracked and was very dry. The ground almonds probably make it very brittle. Next time, I'll add a bit more egg white or water to help it hold together. Shaping them was an exercise in patience: my cookie cutter was only slightly larger than the diameter of the tartlet pans, so I had to do a lot of patching. Then you have to line each one of the suckers with foil and weigh it down with beans! The ganache is superbly flavoured, the passion fruit juice giving it a bit of zing. Lemon-steeped apricots with a hint of black pepper are the finishing touch on these tartlets.